When Mahsa is not travelling for work she joins us 5 times a week, read below on the amazing results she’s seen and what Tempo Pilates helped her accomplished. I joined Tempo Pilates in May. I have a hip condition that has kept me from running these past few years. My physiotherapist had told me I needed to strengthen my core, and I finally got around to it by joining Tempo Pilates and attending classes at least 4-5 times a week. How has Pilates changed your day-to-day life? Have you noticed any differences when you are at work? So my hip problem which usually flared up for me at least once a month has basically disappeared, and I’m running my first half-marathon next Sunday (after I was told to stop running long distance back in 2013). If you find the moves too challenging, you can lose yourself in the breathing or the music, and before you know it, that 2-minute difficult plank is over. What motivates you to maintain a regular exercise routine? Being able to run, and not being crippled by hip pain. Of course, feeling like my body is looking really toned and strong since I started doing Tempo Pilates obsessively is a pretty nice added bonus. Campania for a nice meal, and then next door at Printers and Stationers for drinks is always a lovely time. After working all over the world, natural performer Michelle Lane joined sister Cat Lane as an instructor at Tempo. This month we’re speaking to her about travels, interests, and tips to get the most out of your routine. TP: When did you first hear about Pilates? When I was at dance college we had Pilates classes to help us gain core strength, which is crucial for dancing. It was vital for reaching a professional standard in dance and for avoiding injury and helping existing injuries. TP: How long had you been doing it before you wanted to become an instructor? I looked into becoming an instructor as a side job when I left college, so about 3 years. However, I didn’t get round to doing my instructor training until 8 years later! TP: What’s some advice you have for a new student at Tempo Pilates? Choose a reformer where you can see others around you, so you can get the gist of the movements. We keep the class flowing (hence ‘Tempo’), so take things at your own pace and soon you’ll enjoy the flow of the class and will be rising to new challenges every time! Your instructor will assist you as much as possible. TP: What are some other forms of exercise you do/would recommend? Yoga for deep stretches and ‘zen’, and for cardio I like a good dance aerobics type class because it’s fun so you don’t mind that you’re out of breath! Try to use your technique from Pilates in all forms of exercise (breathing, core, control, alignment), and you’ll be working efficiently, effectively and safely. TP: You recently went to Japan for work before starting at Tempo, what was it like? Was there much of a Pilates presence? Japan was amazing and I’d recommend it to anyone! I was in Tokyo doing a show so in my time off I was doing as much sightseeing as possible. I understand there is a Pilates scene in Tokyo – it’s a very happening city and a lot of the international Pilates training methods exist there too. TP: You’re in the WC2 | Covent Garden studio every weekend, do you have any recommendations for things to do and see in the area after a class? Well, I love theatre so watching a show is a must! I love Neal’s Yard, the Jubilee Market, Seven Dials, and there’s a beautiful little-secluded garden called The Phoenix Garden, down Stacey Street. TP: A good film/show/book/performance you’ve read/seen recently? I saw An American In Paris recently and it was beautiful. Lovely catchy tunes and beautiful dancing. The cast was very multi-talented! Also the film ‘Tallulah’…dark and funny and brilliant. 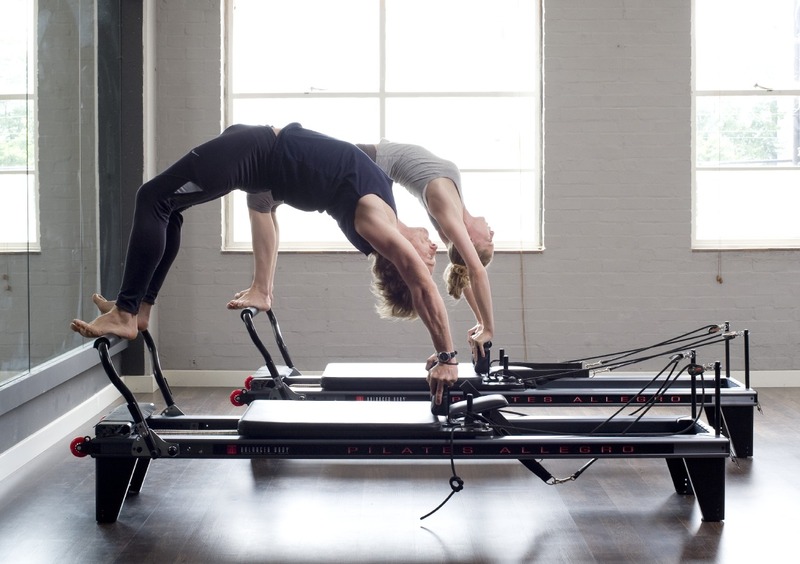 Catch Michelle’s reformer pilates classes in our E8 | Hackney and WC2 | Covent Garden studios today! Nicholas joined us in October 2012, attend 2-3 times a week and see an amazing improvement in flexibility, core strength and mastered the plank. TP: When and what made you decide to join Tempo Pilates? Nicholas: October 2012, at the suggestion of my wiser half. Nicholas: I have become more flexible! Nicholas: An hour of great exercise flies by, and is enjoyable. TP: What is your favourite Tempo Pilates playlist tune? Nicholas: Walk the Moon – Shut Up and Dance. TP: What do you do to wind down after a class? Nicholas: A light run home, or cycling to work. A dancer from the age of four, Tempo Pilates instructor Maureen was first introduced to Pilates when specialising in contemporary dance and used Pilates as a way to prevent injuries during the intense training. It was love at first sight. Here we chat to her about dance, places to eat around our E8 studio and more. TP: What made you get into Pilates? Maureen: It was back when I was training dancing. In order to prevent injuries and also to improve our technique, we had to practice Pilates twice a week. It was then when I realised how beneficial it was for my fitness. I believe it helps with posture and strengthening the muscles that aren’t necessarily being used in our daily lives. Maureen: I had never done reformer Pilates before going to Tempo Pilates and it blew my mind! I find Tempo Pilates challenging and the music makes it fun at the same time. I guess as a dancer moving to music comes naturally, and I love exercising to the tempo of the music; it distracts me from pain and fatigue and elevates my mood, which helps me to keep pushing. TP: What changes have you noticed on your body since starting Tempo Pilates? Maureen: I feel stronger and leaner, I have a lot more energy and stamina and I feel healthy. In short, I’m happy! TP: What is your go-to exercise on the reformer? Maureen: I love lunges because they really work your leg muscles and are great for the glutes! (laughs) – I tend to use them a lot when I teach classes. TP: How do you keep fit outside the reformer? Maureen: I have been going to Hot Yoga classes at Fierce Grace in Old Street. I also enjoy a bit of jogging. Maureen: I love Joe and the Juice as well as Ellory, located downstairs to the E8 | Hackney studio, they serve delicious sharing plates. Maureen: I really like Sia Marshall @sianmarshallpilates and also Joni Weeks @jjweeks_pilates on Instagram, you should check them out! Maureen’s classes at Tempo Pilates exude her love for movement and music, find out more about her click here> and or check our schedule to attend to one of her classes!